This is the first documented use of seal Q.
Rakusan did not include the Fan Series in his main sequence numbering. Therefore, the original number used for each of the 36 Series prints has been modified to identify the Fan Series members of its theme. The five different fan silhouette shapes have been here assigned arbitrary numbers 1 through 5. To indicate a fan design these shape designations are added to the 36 Series number separated by a hyphen. 110-1 is the Fan Series design with fan shape 1 in the 110 Persimmon theme. Like all other designs in this series, 110-1 was only produced in a single print run, and few copies are currently documented. 110-1 is the first known use of minor seal Q, but currently with so few examples of that seal, it is difficult to determine to which major seal use period it properly belongs. However, the inconsistencies of style (see below) suggest that 110-1 must be a relatively early design - perhaps assignable to the seal A period during the last half of 1933. The pairing of the persimmon and the white-eye is a traditional one in Japanese art. Rakusan used the combination both in 110-1, as well as in the later 36 Series design 110. 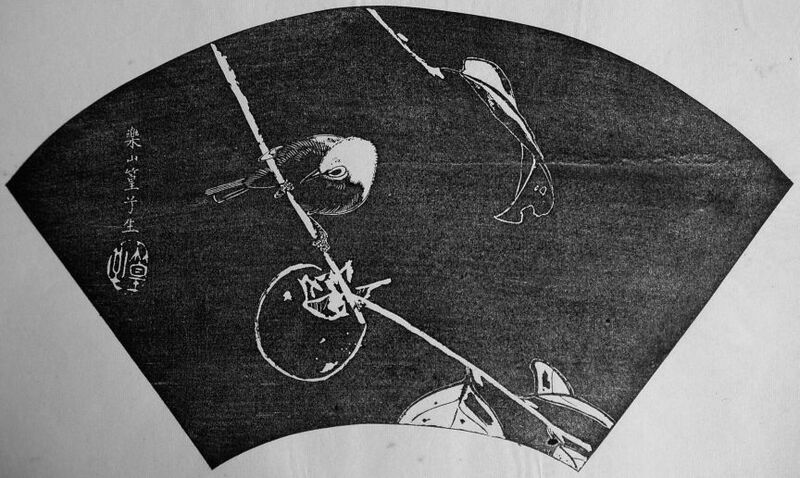 At least some later designs were adapted from sketches originally created in the late 1920s during the planning of the earlier 100 Series, persimmons from 19 and white-eyes from 67 (see below). The composition of 110-1 is an attractive arrangement including two persimmon branches with a fruit and a few leaves. A white-eye is sitting on one of the branches. 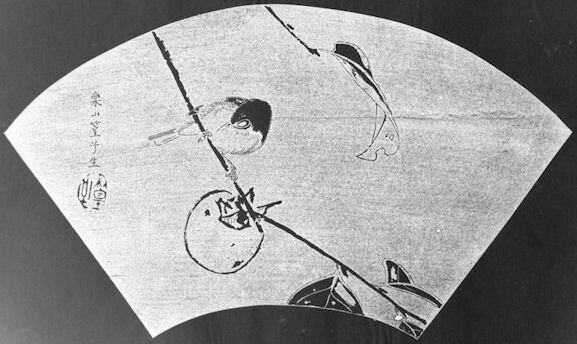 However, rendition of the original design created a number of inconsistencies which suggest the design was carved very early while Rakusan was still sorting out the problems of ishizuri negative printing. One early technique is the double outlining of parts of the leaves (which was also used in 110-3, the other early design in this theme). More seriously, as printed parts of the bird are in their natural tones: legs and feet, bill, eye, and white eye-ring. However, if Rakusan had continued in that same unreversed style, the head and back would instead have been dark, and the neck and belly light. Unfortunately, the resultant admixture of technique makes this very familiar kind of bird look peculiar in either the ishizuri or the presumed original version. Japanese White-eye, Zosterops japonicus, 繡眼児, 眼白, now usually 目白, めじろ, メジロ, mejiro, lit. 'white eye', is a familiar native species. The little birds are fond of overripe and fermenting fruit. Sometimes they become intoxicated and are easily caught to be kept as pets. Rakusan was fond of portraying these active little birds, and they appear in several of his designs.